Please contact us to learn more :	Email: info@a100things.com, Phone: 805-405-3164. Thank you for considering A 100 THINGS for your website development and social media consulting needs. We look forward to help you succeed. Our motto is WE LEAVE NO PAGES "UNDER DEVELOPMENT". This means that we will not leave unfinished pages with words "Under Development" hanging on your website for months and years. We will finish your website, period. A 100 THINGS provides reliable and individual website consulting, website design and development for small companies, individual business owners in Ventura County. We have fair pricing explained up front and discussed in detail. We have built our business on the following fundamentals: Trust, Timeliness and Flexibility. A 100 THINGS is located in Ventura County. 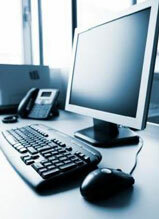 We have been providing Internet Consulting services to local businesses for over 10 years. We improve your ratings on Yelp and Google by addressing negative comments with positive replies and attitude towards improvement of your business. We learn from the reviews and provide feedback to you - on how to improve your ratings by providing better customer service.